I’ve been working pretty steadily on my Honeybee cardigan, when time and attention span have permitted. Today I reached a milestone; the point where I’m done with any decreases and just have to do several sets of short rows to shape the front and back shoulders. Phew! I tried it on, and the fit is weird but I’m attributing that to the fact(s) that the short rows aren’t done and the top part hasn’t been blocked yet. 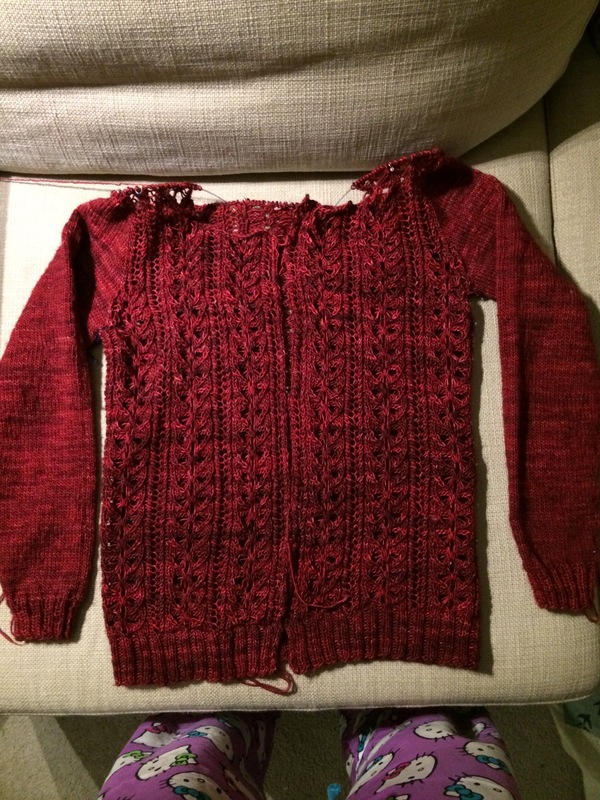 AND there will be button bands and a neck edging… Fingers crossed! Oh, that is just cute! The color is awesome lovely, too. I haven’t even attempted my first scarf, yet. A scarf is pretty easy, but definitely choose something smallish so you can have a finished object soon! Which yarn did you use? It’s beautiful! Madeleine tosh merino light, in the colorway Tart!